Download "Security management solutions White paper. 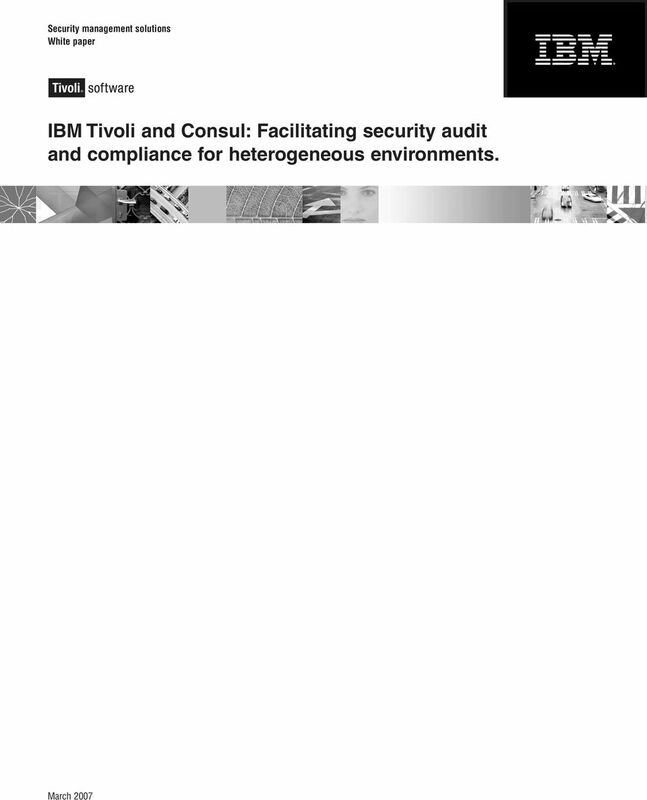 IBM Tivoli and Consul: Facilitating security audit and compliance for heterogeneous environments." 2 2 Contents 2 Overview 3 Identify today s challenges in security audit and compliance 3 Discover how Consul products enhance the IBM security management portfolio 5 Leverage extended Consul functionality through integration with other IBM products 6 Combine the benefits of Consul and IBM Tivoli solutions 8 Conclusion 8 For more information Overview Security and compliance challenges are greater than ever because of increased regulatory requirements and costs of compliance failures, increased complexity in technologies and IT environments, and a lack of predictability and visibility across infrastructures. To help address these challenges, IBM continues to expand its security management portfolio through development and acquisitions. One such acquisition is Consul risk management international, B.V., a recognized leader in policy-based security audit and compliance. Designed for both distributed and mainframe environments, Consul products provide capabilities that combine with the IBM Tivoli security management portfolio to help organizations: Assess the overall security and compliance status of business infrastructures: Capture comprehensive log data. Analyze data through sophisticated log interpretation and normalization. Communicate results to management and auditors through a drillable dashboard and full set of audit and compliance reports. Defend against potential security threats and business risks across the enterprise: Deliver comprehensive, end-to-end security management. Improve security information and event management, addressing both internal and external threats. Enhance preemptive security solutions. Access control for business systems and information to help maximize integrity and facilitate compliance: Enable a mainframe-based hub for enterprise security management. Combine security with compliance management. Develop and support policy-based access and identity management. Monitor internal and external behaviors, address violations and manage data: Monitor privileged users and their activities, including system administrators and database administrators (DBAs). Automate analysis of user behavior against security policies to identify noncompliant activity. Take action based on compliance violations. 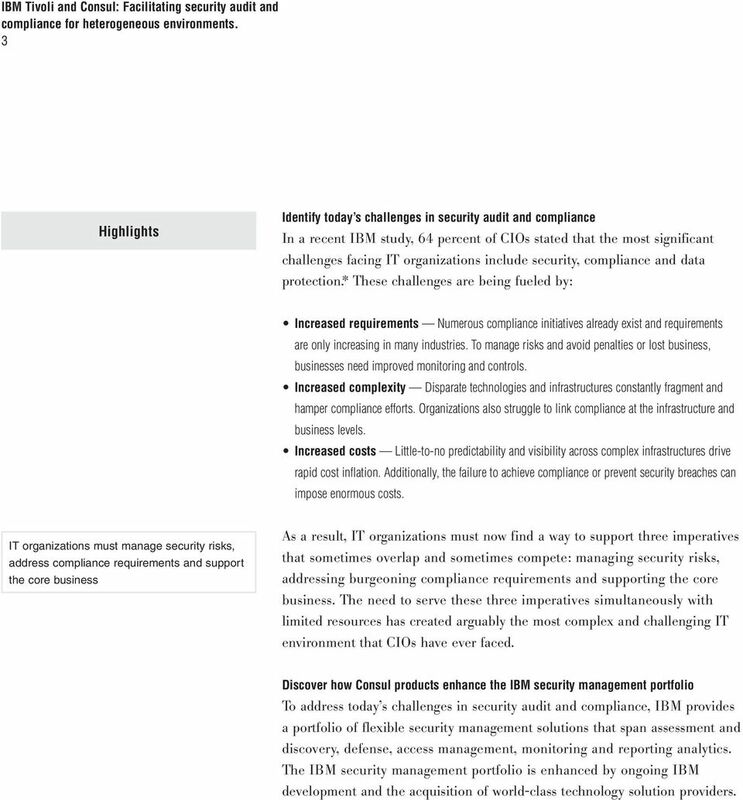 3 Highlights Identify today s challenges in security audit and compliance In a recent IBM study, 64 percent of CIOs stated that the most significant challenges facing IT organizations include security, compliance and data protection. * These challenges are being fueled by: Increased requirements Numerous compliance initiatives already exist and requirements are only increasing in many industries. To manage risks and avoid penalties or lost business, businesses need improved monitoring and controls. Increased complexity Disparate technologies and infrastructures constantly fragment and hamper compliance efforts. Organizations also struggle to link compliance at the infrastructure and business levels. Increased costs Little-to-no predictability and visibility across complex infrastructures drive rapid cost inflation. Additionally, the failure to achieve compliance or prevent security breaches can impose enormous costs. IT organizations must manage security risks, address compliance requirements and support the core business As a result, IT organizations must now find a way to support three imperatives that sometimes overlap and sometimes compete: managing security risks, addressing burgeoning compliance requirements and supporting the core business. The need to serve these three imperatives simultaneously with limited resources has created arguably the most complex and challenging IT environment that CIOs have ever faced. Discover how Consul products enhance the IBM security management portfolio To address today s challenges in security audit and compliance, IBM provides a portfolio of flexible security management solutions that span assessment and discovery, defense, access management, monitoring and reporting analytics. The IBM security management portfolio is enhanced by ongoing IBM development and the acquisition of world-class technology solution providers. 4 One such acquisition is Consul risk management, B.V., a recognized leader in policy-based security audit and compliance. Designed for both distributed and mainframe environments, Consul products include: Consul InSight Suite that captures comprehensive log data and then interprets the data through sophisticated, patent-pending W7 analysis, privileged user monitoring and out-of-the-box compliance support modules. Consul InSight Suite helps greatly accelerate policy and compliance initiatives. Consul zsecure Suite of integrated mainframe tools that enable mainframe administration managers, security officers and auditors to facilitate compliance with regulations, prepare for and pass security audits, improve operational efficiency and reduce chances of downtime. 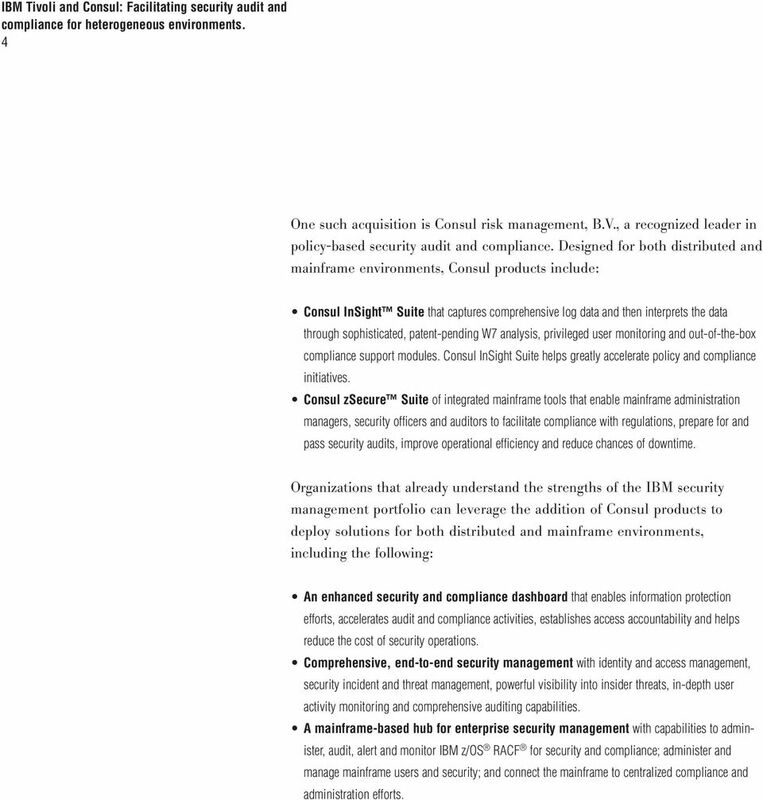 Organizations that already understand the strengths of the IBM security management portfolio can leverage the addition of Consul products to deploy solutions for both distributed and mainframe environments, including the following: An enhanced security and compliance dashboard that enables information protection efforts, accelerates audit and compliance activities, establishes access accountability and helps reduce the cost of security operations. Comprehensive, end-to-end security management with identity and access management, security incident and threat management, powerful visibility into insider threats, in-depth user activity monitoring and comprehensive auditing capabilities. A mainframe-based hub for enterprise security management with capabilities to administer, audit, alert and monitor IBM z/os RACF for security and compliance; administer and manage mainframe users and security; and connect the mainframe to centralized compliance and administration efforts. 5 Highlights IBM customers can extend their existing investments with Consul products that enhance support for mainframe investments By leveraging Consul capabilities to enhance support for mainframe investments, IBM helps customers extend the value of their existing investments and minimize disruptions when they adopt new security management technologies. They can take a phased approach to enhancements and continually verify that the solutions they deploy will align with their strategic initiatives. Additionally, Consul best practices combine with those that IBM has developed for both distributed and mainframe environments to help customers address standards, laws and compliance initiatives, including the Sarbanes-Oxley Act (SOX), the Health Insurance Portability and Accountability Act (HIPAA), the Gramm-Leach-Bliley Act (GLBA), Basel II and ISO Leverage extended Consul functionality through integration with other IBM products Organizations that already use Consul products can also enjoy substantial benefits from future integration of Consul products with other IBM security management offerings. 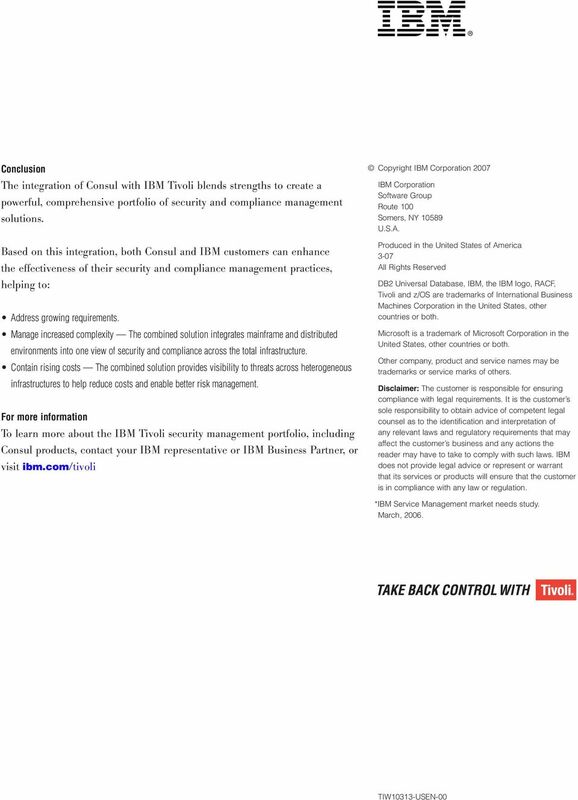 The following examples show the extended benefits planned through the future integration of Consul InSight, Consul zsecure and the IBM Tivoli security management portfolio. Security information and event management (SIEM): An SIEM solution integrates security information management (SIM) with security event management (SEM). To support this objective, all events and alerts from Consul InSight can be forwarded in real time to the IBM Tivoli Security Operations Manager console. At the same time, events and alerts generated by IBM security management tools can be populated within Consul InSight for normalization and compliance reporting. This integration harmonizes the collection infrastructure among the product lines, thereby supporting an effective, comprehensive SIEM solution. 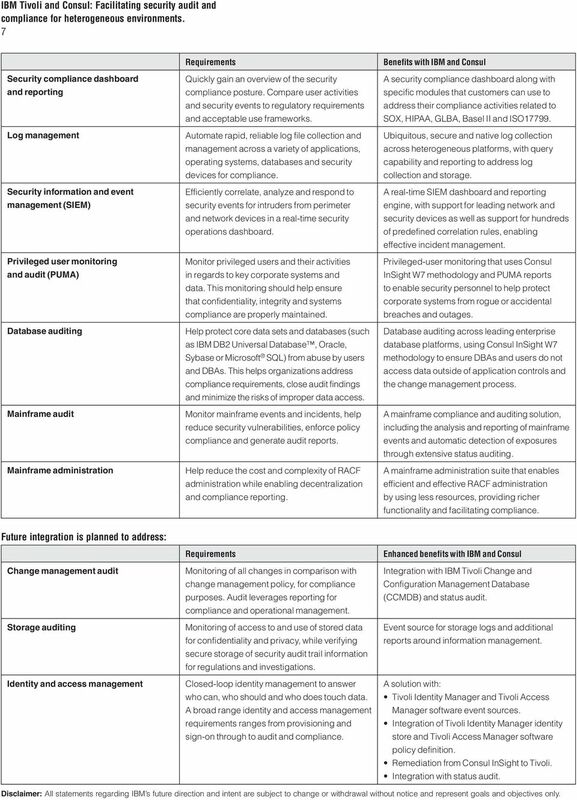 6 Change and configuration management: One of the biggest contributors to IT outages is unregulated or unauthorized change. 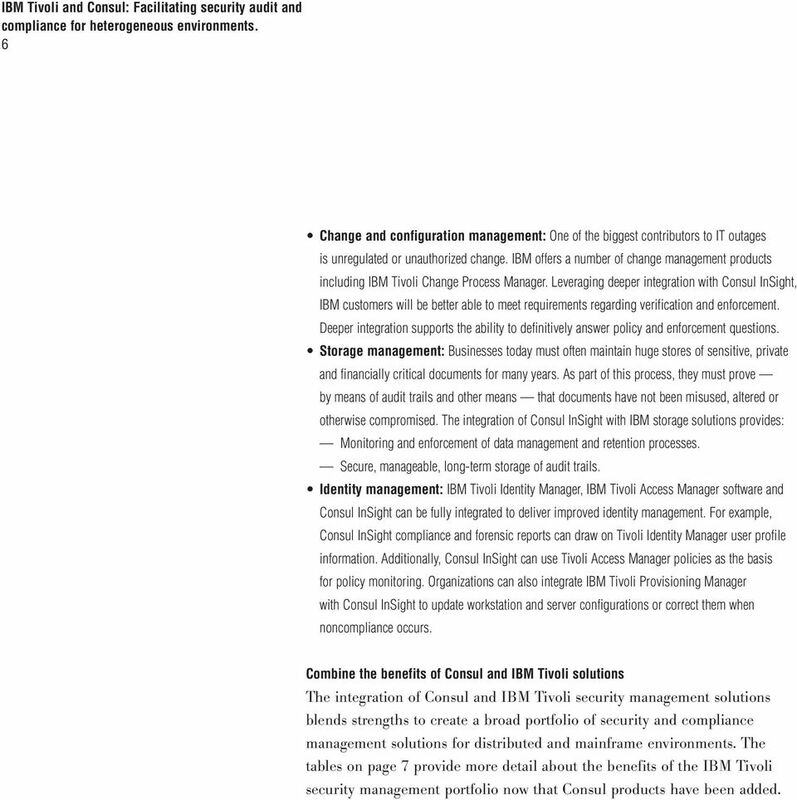 IBM offers a number of change management products including IBM Tivoli Change Process Manager. Leveraging deeper integration with Consul InSight, IBM customers will be better able to meet requirements regarding verification and enforcement. Deeper integration supports the ability to definitively answer policy and enforcement questions. Storage management: Businesses today must often maintain huge stores of sensitive, private and financially critical documents for many years. As part of this process, they must prove by means of audit trails and other means that documents have not been misused, altered or otherwise compromised. The integration of Consul InSight with IBM storage solutions provides: Monitoring and enforcement of data management and retention processes. Secure, manageable, long-term storage of audit trails. Identity management: IBM Tivoli Identity Manager, IBM Tivoli Access Manager software and Consul InSight can be fully integrated to deliver improved identity management. For example, Consul InSight compliance and forensic reports can draw on Tivoli Identity Manager user profile information. Additionally, Consul InSight can use Tivoli Access Manager policies as the basis for policy monitoring. Organizations can also integrate IBM Tivoli Provisioning Manager with Consul InSight to update workstation and server configurations or correct them when noncompliance occurs. Combine the benefits of Consul and IBM Tivoli solutions The integration of Consul and IBM Tivoli security management solutions blends strengths to create a broad portfolio of security and compliance management solutions for distributed and mainframe environments. 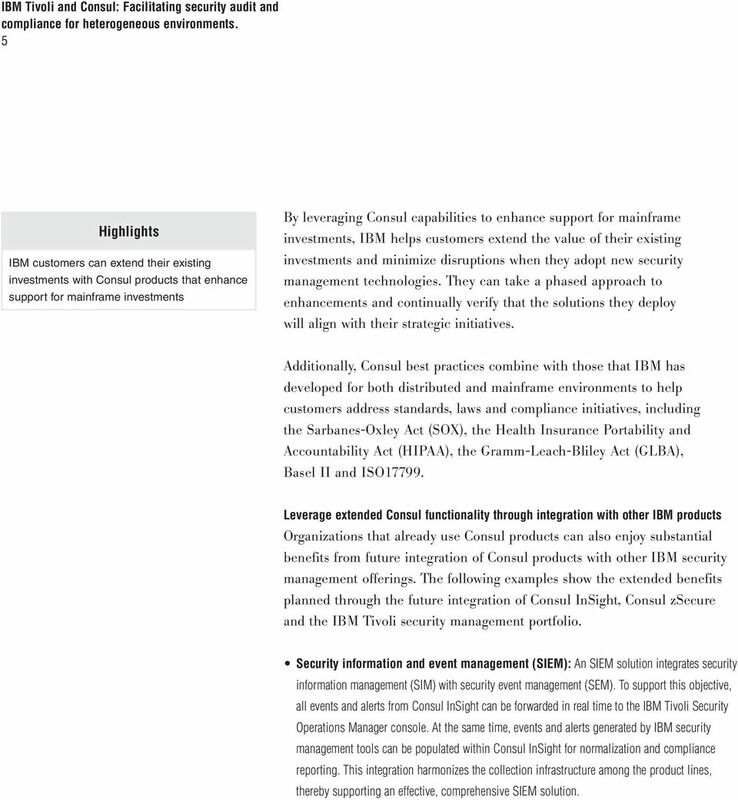 The tables on page 7 provide more detail about the benefits of the IBM Tivoli security management portfolio now that Consul products have been added. 7 7 Security compliance dashboard and reporting Log management Security information and event management (SIEM) Privileged user monitoring and audit (PUMA) Database auditing Mainframe audit Mainframe administration Requirements Quickly gain an overview of the security compliance posture. Compare user activities and security events to regulatory requirements and acceptable use frameworks. Automate rapid, reliable log file collection and management across a variety of applications, operating systems, databases and security devices for compliance. Efficiently correlate, analyze and respond to security events for intruders from perimeter and network devices in a real-time security operations dashboard. Monitor privileged users and their activities in regards to key corporate systems and data. This monitoring should help ensure that confidentiality, integrity and systems compliance are properly maintained. Help protect core data sets and databases (such as IBM DB2 Universal Database, Oracle, Sybase or Microsoft SQL) from abuse by users and DBAs. This helps organizations address compliance requirements, close audit findings and minimize the risks of improper data access. Monitor mainframe events and incidents, help reduce security vulnerabilities, enforce policy compliance and generate audit reports. Help reduce the cost and complexity of RACF administration while enabling decentralization and compliance reporting. Benefits with IBM and Consul A security compliance dashboard along with specific modules that customers can use to address their compliance activities related to SOX, HIPAA, GLBA, Basel II and ISO Ubiquitous, secure and native log collection across heterogeneous platforms, with query capability and reporting to address log collection and storage. A real-time SIEM dashboard and reporting engine, with support for leading network and security devices as well as support for hundreds of predefined correlation rules, enabling effective incident management. Privileged-user monitoring that uses Consul InSight W7 methodology and PUMA reports to enable security personnel to help protect corporate systems from rogue or accidental breaches and outages. Database auditing across leading enterprise database platforms, using Consul InSight W7 methodology to ensure DBAs and users do not access data outside of application controls and the change management process. A mainframe compliance and auditing solution, including the analysis and reporting of mainframe events and automatic detection of exposures through extensive status auditing. A mainframe administration suite that enables efficient and effective RACF administration by using less resources, providing richer functionality and facilitating compliance. Future integration is planned to address: Change management audit Storage auditing Identity and access management Requirements Monitoring of all changes in comparison with change management policy, for compliance purposes. Audit leverages reporting for compliance and operational management. Monitoring of access to and use of stored data for confidentiality and privacy, while verifying secure storage of security audit trail information for regulations and investigations. Closed-loop identity management to answer who can, who should and who does touch data. A broad range identity and access management requirements ranges from provisioning and sign-on through to audit and compliance. Enhanced benefits with IBM and Consul Integration with IBM Tivoli Change and Configuration Management Database (CCMDB) and status audit. Event source for storage logs and additional reports around information management. A solution with: Tivoli Identity Manager and Tivoli Access Manager software event sources. Integration of Tivoli Identity Manager identity store and Tivoli Access Manager software policy definition. Remediation from Consul InSight to Tivoli. Integration with status audit. Disclaimer: All statements regarding IBM s future direction and intent are subject to change or withdrawal without notice and represent goals and objectives only. Security management solutions White paper. Extend business reach with a robust security infrastructure. 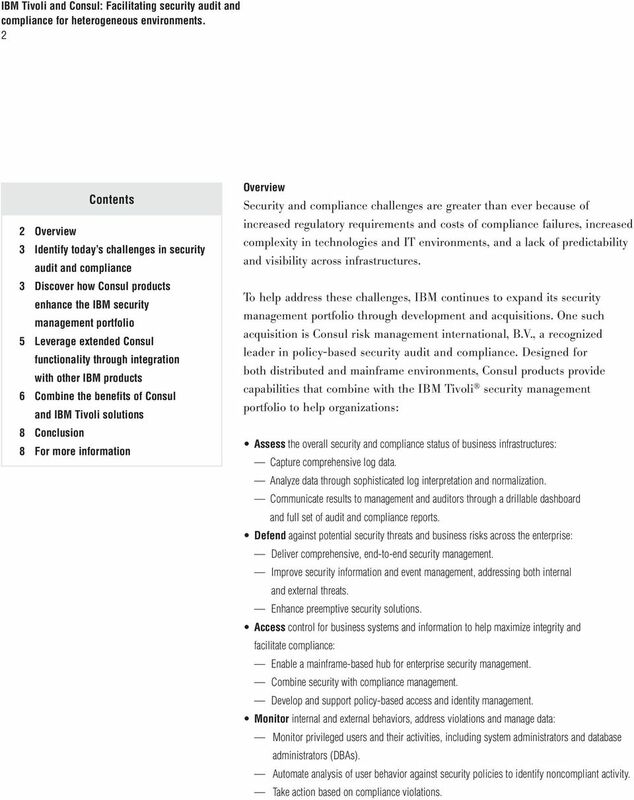 Security management White paper. Develop effective user management to demonstrate compliance efforts and achieve business value. Enterprise Security. Moving from Chaos to Control with Integrated Security Management. Yanet Manzano. Florida State University. manzano@cs.fsu. Security solutions White paper. Succeeding with automated identity management implementations.